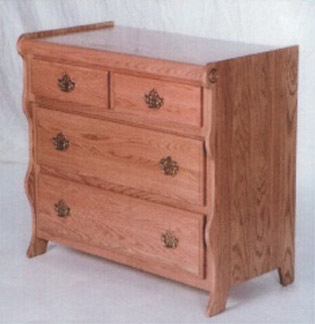 Our 41” Amish made sleigh style dresser, shown here in solid oak, is the smallest of the dressers in our sleigh-style bedroom collection. It has two large and two small drawers for a good mix of storage, and can take the optional rail style or center mirror if you would like. This is a great dresser for those who want to stay with the sleigh style, but don’t have much room, and the beauty of the solid oak will accent any room. It would also be a good choice for an addition to a bedroom that just needs a little more storage to be complete - and once again, it will make a great place to put the TV in the bedroom!